He grew up in one of the most poverty stricken areas in the United States, in the rural plains of South Dakota on the Rosebud Reservation. He is a Lakota man whose mission is to encourage and inspire all of the indigenous peoples who have been oppressed since 1496. 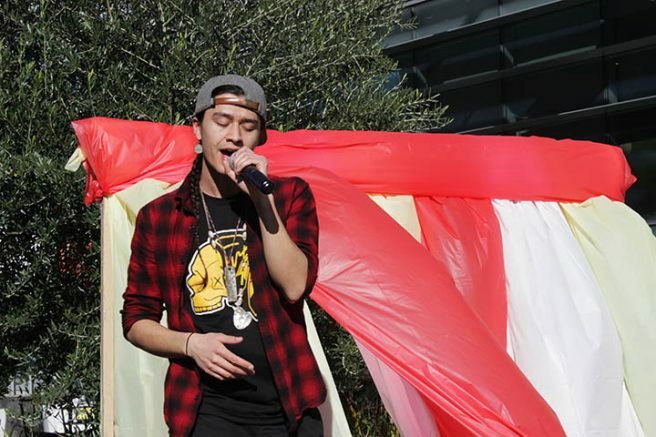 His name is Frank Waln and he came to ARC with his band mates, Sam and Micco Sampson, The Sampson Brothers, and they performed in the quad at American River College on Thursday. Waln is an indigenous rapper and producer, Micco is an indigenous choreographer and hoop dancer, and Sam is an indigenous visual artist, hoop dancer and flute player. Together they travel around the world and fuse the modern with the traditional. The music is heavily laden with synthesizers, drum machines and samples that echo the cries of their ancestors. Visually the trio has more to showcase than just your standard stage setup with instruments and musicians. 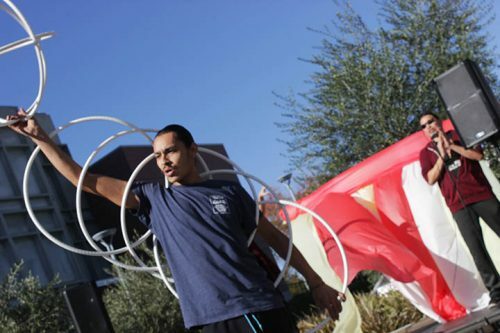 Micco and Sam both perform hoop dancing, a tradition passed down from their ancestors. A tradition that can best be described as a mixture between something you’d see in the “Guinness Book of World Records,” and a pow wow on the dusty and rural plains of South Dakota. Anywhere from a few to over twenty hoops can be used for the dance. Micco showcased his physical strength, flexibility, creativity and ingenuity all within the span of about thirty minutes. Spectators gathered around and watched in silence as they were “(shown that) we are all born into a perpetual circle and cycle… we are all a part of this hoop,” Micco said. After the performance, students were invited to join Waln and the Sampson Brothers in community rooms one and two. Waln started off by giving a little background history about his life. He started writing songs at 13, wrote and recorded his first song at 15, graduated valedictorian of his high school class, received the Gates Millennium scholarship and graduated from Columbia College Chicago in 2014. All of the accomplishments he listed were accompanied by some clapping or head nods. It seemed that they were well received and only reinforced his desire to be a positive influence for the indigenous youth. Then he told a story that perfectly encompassed why he does what he does. All Waln had been exposed to, up until college, were wide open plains and prairies. After getting off of an elevator in Chicago a girl said he had very pretty hair. Waln has ebony colored hair usually worn in two long braids. The girl then asked Waln what he was. He replied, “Lakota.” Waln said she looked confused so he said he was Native American. “I can’t believe there are college educated adults who think my people are extinct,” Waln said. Some audience members gasped and many sat silent, almost as a testimony to the fact that this type of ignorance is widespread. “That ouch you feel… we feel that everyday of our lives,” Waln said. Micco was the following act. He loosened up the audience members with jokes and an outgoing and lively personality. 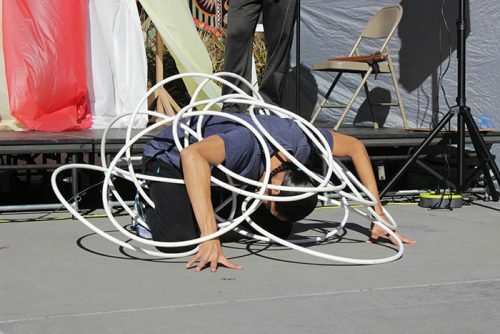 He performed an elaborate hoop dance where he took the audience step by step, hoop by hoop, on a journey into the meaning behind each move and what they represented. Humor aside Micco imparted a lot of knowledge and wisdom – knowledge and wisdom that he said has been passed down through his ancestors’ storytelling. Looking at Waln, Sam and Micco through a larger scope, it is clear to see that storytelling is exactly what they are doing. Waln’s music can be found on iTunes, Spotify, Soundcloud & Bandcamp. Be the first to comment on "Indigenous artists perform at ARC to spread cultural awareness"